The main concerns that Bradfield and others involved in planning Sydney’s transport in the first decades of the 20th century faced seem very familiar; inadequate infrastructure failing to meet the demand from the rapidly-growing increase in people and freight entering the city. The city’s ports were rapidly expanding, while steam ferries and electric trams struggled to carry passengers and from Central Station into the CBD. Patronage on the city’s suburban steam railways increased by an average of 12.6% annually between 1910 and 1914, while tram traffic increased by 10.7%. As Bradfield observed, traffic had reached “saturation point”. Bradfield certainly wasn’t the first proponent for the construction of both a harbour crossing and a railway from Central Station into the city; prior to his 1916 report there had been dozens of proposals, reports and several commissions of inquiry looking at these issues. Bradfield had contributed to this ongoing debate, and by the time of his 1914 trip was already in charge of plans both the Harbour Bridge and the new City Railway. 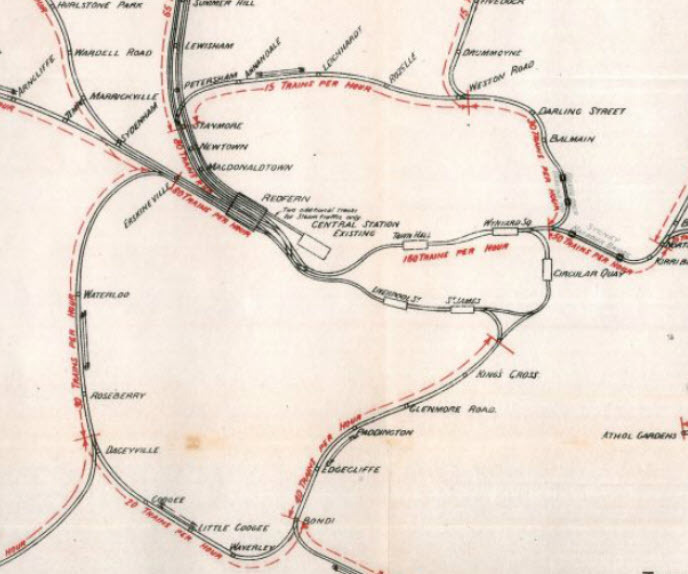 Bradfield’s 1916 map of train capacity (detail). Source: Bradfield’s report on proposed electric railways, NSW State Archives. Bradfield always thought big, not only terms of proposals for new lines but also their capacity. His overseas trip was obviously a major influence; based on his observations he argued that each line in the proposed City Railway should be built to accommodate 40 trains an hour during the peak in each direction, assuming the system was fitted with “electric signalling and automatic train stops”. 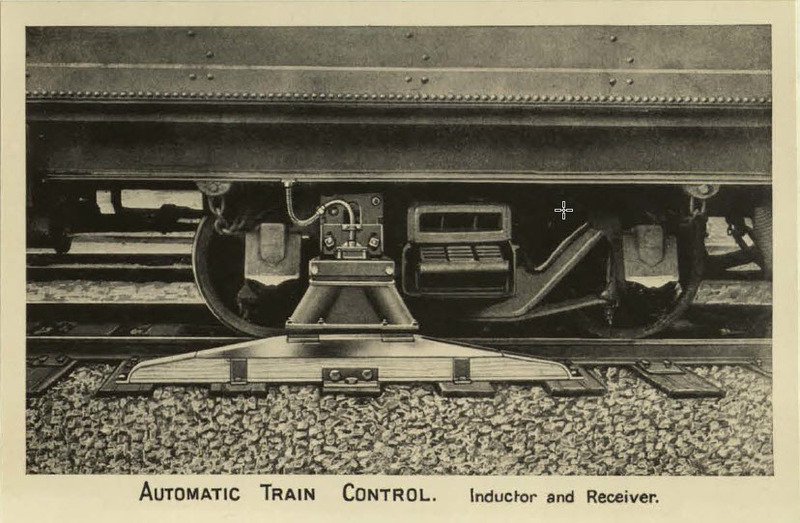 Automatic Train Control – 1920s style. Source: Bradfield Thesis, University of Sydney. Bradfield’s survey of overseas systems also influenced his views on the optimum design for railcars. He envisaged that the new trains would comprise powered railcars (electric multiple units, or EMUs), rather than be hauled by electric locomotives. He proposed that the new fleet be built up gradually, starting with seven or eight-car trains comprising brand-new steel-bodied power cars and existing wooden cars as trailers, though he suggested that some of the latter would need to be equipped as power cars. His views in 1916 on the actual design of the proposed railcars seem less clear. At some points in the report he favoured carriages with three or four automatic doors, longitudinal seating and a high proportion of standing passengers, but he then reverted to the then traditional Australian and UK models of predominantly transverse seating. For most of his calculations Bradfield assumed 100 seated passengers and 50 standing per car, a total of 150 passengers or 1,200 per eight-car train. However, he also mentions that a seven-car train could carry up to 1,900 passengers, or 270 per car. Even at the frequencies and speeds he proposed this would have given each line a peak capacity of nearly 50,000 in peak hour. By any definition then or now this would have been a rapid transit system. Later Bradfield adopted lower estimates of train capacity. The first rail cars built in anticipation of electrification (somewhat confusingly called “Bradfield cars”, even though they were designed by Chief Mechanical Engineer Edward Lucy) were wooden-bodied trailers with transverse seating and four doors per side. While these cars were named after him, this was not the defining railcar of the Bradfield era. 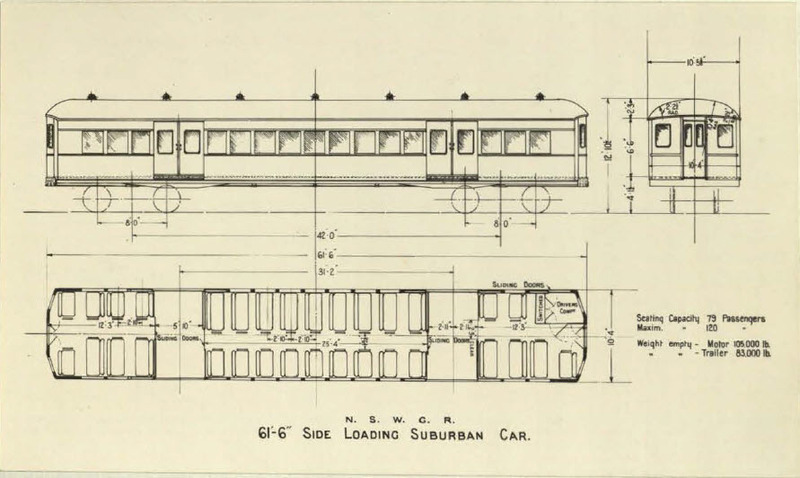 In his 1924 thesis Bradfield describes the cars “designed for the City Railway” which would seat 79 with, only 40 standing, a total capacity of around 120. These steel-bodied cars had two double doors a side with large entry areas to improve access and provide standing room. They had a large central saloon between the entry areas with vestibules at either end all with transverse seating. These “red rattlers” and their successive variants became the mainstay of the Sydney rail system until their final withdrawal in 1992. Over time they were modified and as new trains were produced the design was subtly changed, for example longitudinal seats were installed in the end vestibules to increase standing room. By 1924 Bradfield had also become a little more conservative in his estimation of train frequencies. In his thesis he estimates that the capacity on a line with automatic signals would be 36 trains per hour (a train every 100 seconds). Based on eight-car trains with 120 passengers per car or 960 per train this would work out at a still-high maximum of 34,560 passengers per hour. Bradfield’s thesis also outlines in great detail his plans for all the elements to make his vision of a rapid transit network a reality, including station location, design and access, tunnel dimensions, signalling systems, track layout and the supply of electricity. In practice the Sydney network never quite reached the train frequencies Bradfield anticipated. The highest figure achieved was 30 trains per hour at St James Station in the 1930s, when it operated as a terminus before the City Circle was completed in 1956. At 960 passengers per train this would have represented a maximum capacity of 28,800 passengers per hour. However, the biggest change was to dramatically boost capacity not by increasing frequency but by introducing double-deck trains. The first double-deck trailers appeared in 1964 and double-deck power cars in 1968, which meant that Sydney had the first fully double-deck EMUs in world. These trains and their successors have been equipped with two double doors on each side, upstairs and downstairs saloons with transverse seating and end vestibules with longitudinal seats. The latest incarnation, the Waratah sets, seat 900 passengers and have a total notional capacity of 1,210, though in practice their “crush” capacity is much higher. Ironically, these trains were feasible because of the generous loading gauge Bradfield adopted in building the City Circle tunnels. In part the decision to increase train capacity – in particular, the number of seated passengers – as opposed to frequency reflected the realities of the limited development of the Sydney rail network in the post-Bradfield era. This will be considered in a future post, but in summary while Bradfield succeeded in constructing the critical sections of the rail system through the CBD, a range of factors prevented the completion of his wider vision for a network of high-capacity inner-city lines. In effect the only part of the resulting system that could really be described as “rapid transit” in operation was the small CBD section where the branches of what remained predominantly a suburban railway network converged. Over time frequency was traded for capacity, especially for off-peak and weekend services which in many parts of Sydney were reduced to half-hourly. The “rapid transit trains” currently being delivered for the Sydney Metro owe more in design to Bradfield’s 1916 vision, at least conceptually, than they do to Sydney’s current train fleet. This is not so surprising, as the metros and subways Bradfield studied in 1914 became the templates for the development of hundreds of urban rail systems around the world (just as Sydney’s double-deck fleet has inspired the development of similar suburban trains in other countries since the 1970s). 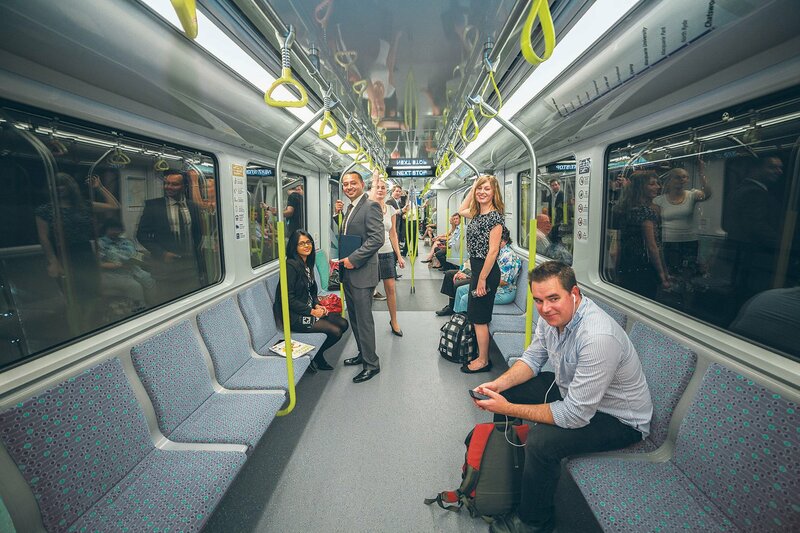 The new Sydney metro trains feature 100% longitudinal seating; each car will carry 183 passengers but only 63 will be seated. They will run in six-car sets with a total capacity of 1,100 passengers but can be expanded to eight-car trains which could carry up to 1,540 people. Initially the trains will run every four minutes, but when stage two is completed in 2024 there will be up to 30 trains an hour with a maximum capacity of 40-46,000 passengers, depending on configuration. This is similar to Bradfield’s 1916 estimate, though this was based on higher frequencies and lower numbers of passengers per train. There are three key differences between Bradfield’s vision of rapid transit as it was implemented, and its 21st-century incarnation. The first is that the new lines are being designed to support high-capacity rapid transit from end to end. While this may have been Bradfield’s intention for some of his proposed inner suburban lines, these were never constructed, so as noted earlier only the CBD elements of his system could really be described as rapid transit. However, the downside of the Sydney Metro approach is that a significant number of passengers will have to stand for long periods of time, a factor that probably swayed Bradfield’s decision to opt for trains with a higher proportion of seats. The second is that the new trains will be fully automatic. While Bradfield proposed the most modern elements of automatic train control that were available at the time, these are a far cry from the automated systems of the 21st century. Finally, the new trains will be completely incompatible with the existing system. This would probably surprise Bradfield the most. While he planned for a completely new fleet of electric trains, the first iteration was designed to be compatible with the existing steam-hauled rolling stock while electrification was gradually rolled out. Consciously or otherwise, his modernisation of the rail system also provided it with considerable adaptability, allowing for example the use of double-deck trains. Whatever the merits and disadvantages of the Sydney Metro, the claims about the virtues of rapid transit are certainly not new; Bradfield tried to implement a system based on these principles a century ago. While he didn’t fully succeed, the capacity he built into the Sydney’s rail network through electrification, the construction of the City Railway and the rail lines across Sydney Harbour Bridge have all served the city well over the decades since. The next article in this series will look at some of Bradfield’s proposed but unbuilt lines and their relevance for Sydney’s transport planning today. This entry was posted in Bradfield, Public Transport, Transport and tagged Bradfield, metro, Rail, Transport. Bookmark the permalink.